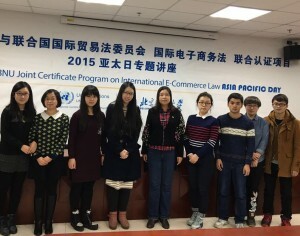 On December 1, 2015, BNU-UNCITRAL Joint Certificate Program on International E-Commerce Law (JCP) successfully organized the UNCITRAL Asia Pacific Day Lecture in the Law School Auditorium of BNU. The Co-Directors of JCP, Prof. Hong Xue, Director BNU IIPL, and Dr. Luca Castellani, UNCITRAL Legal Officer, gave the lectures respectively. 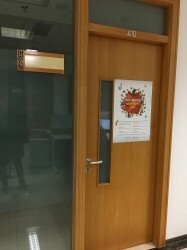 Prof. Xue, at the beginning, gave a briefing of the development of JCP (please refer to the JCP Chronicle at <http://wiki.iipl.org.cn/?cat=11>) and addressed the Program’s great potential on teaching, research and international collaboration. Prof. Xue also circulated the new updated flyer of the JCP to the audience. Dr. Castellani joined remotely from Vienna and gave a lecture titled “The future of e-commerce law: the UNCITRAL perspective”. Although the same lecture has been presented several time at different occasions in Beijing, Dr. Castellani was always able to provide the updated and fresh knowledge and information and inspired the new thinking in this legal area. Many BNU post-graduate students joined the Lecture and actively interacted with the Lecturers, despite Beijing’s terribly smoggy weather all through early December 2015. The students’ passion for international e-commerce law is inspiring all the faculties of JCP to work harder to achieve bigger success of the Program.